So far this year, a total of 348 diabetes-related amputations were done at the three major divisional hospitals in Fiji: Colo­nial War Memorial Hospital, Lau­toka Hospital and Labasa Hospital. Minister for Health and Medical Services, Rosy Akbar made these remarks during the Second NCD (Non-Communicable Diseases) and Diabetes Congress 2018 at Studio 6 Apartments in Suva yesterday. “Of the total amputations done, 216 were males while 132 females also got the amputations,” Ms Ak­bar said. “The Ministry of Health is strong­ly focusing towards prevention of diabetes-related amputations through more regular checks and risk assessments, and earlier treat­ment to keep people with diabetes out of hospital. Ms Akbar said that a total of 386 Community Health Nurses have been trained in Diabetes Retin­opathy Awareness Training and they are able to further assist the District Nurses and Zone Nurses in their programmes for wellness screening. “The most common type (of Diabe­tes) is Type 2, which usually devel­ops in adults, but is becoming more common in children,” she said. “Type 1 diabetes on the other hand, is usually diagnosed in chil­dren and is less common than Type 2 diabetes and the total number of people living with Type 1 diabetes from 2014 to 2018 is 500. “The youngest person living with Type 1 diabetes is 10-years-old in the Northern division and the youngest person living with `Gesta­tional Diabetes Mellitus (GDM) in the North is 19 years of age. Ms Akbar said all Fijians must choose a healthy lifestyle because it is also important that they actively embrace the messages on healthy eating and being physically active by doing regular exercises on a daily basis. “There is a need to encourage people to quit smoking and reduce consumption of kava and alcohol which will go a long way in terms of reducing NCDs. “People also need to know that having adequate rest including having adequate sleep and choos­ing a healthy lifestyle is the only way we can reduce the risk of get­ting NCDs”. 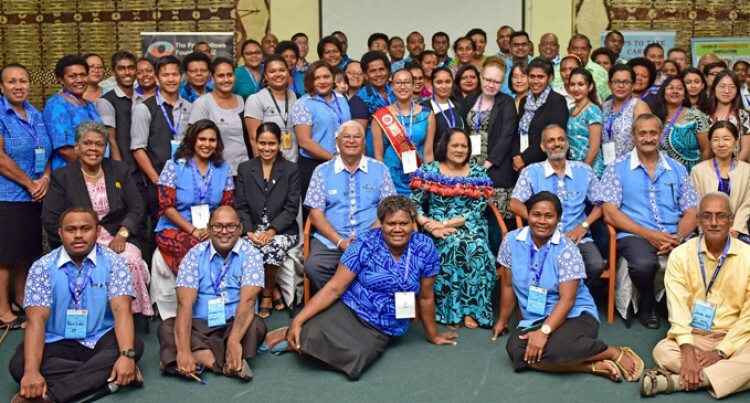 Chairman for Diabetes Fiji, Taabish Akbar said that each and every one of us has the ability and capability to change our lives. “Type 2 diabetes is preventable and measurable, but yet people do not take necessary measures,” he said. “People often feel that since dia­betes is genetic they don’t have a choice. This is incorrect because we have genes for black hair and brown eyes which we have no con­trol over”. Mr Akbar said that diabetes is triggered by the choices we make in our life style. “We need to consume responsi­bly,” he said.